South Africa has always taken great pride in calling itself “the rainbow nation”: a country where diversity and reconciliation have triumphed following the collapse of apartheid’s institutionalized fifty-year dominance. Forging a “rainbow nation” was indeed Nelson Mandela’s greatest endeavor, and so he is remembered by those who, like Barack Obama, have praised and remembered him as the “last great liberator of the 20th century”. Mandela is so respected around the world that it comes as no surprise that over 90 heads of state attended his memorial service on December 10th, and that the 95,000-capacity Johannesburg FNB stadium was packed with people despite the heavy rain. While few challenge his strength of character and ultimate achievement in fighting racial segregation, tougher questions are being asked about the country he leaves behind. Mandela’s legacy is not void of criticism, especially among his compatriots. The vestiges of apartheid still shape South African politics and society. As crime rates increase and the gap between the rich and the poor widens, the country struggles to correct the inequalities established by decades of apartheid, and a general feeling of disappointment with Mandela and his party, the African National Congress, exists both among the white and the black communities. Feelings among the white community are laden with fear. In particular, rumors have it that following Mandela’s death there will be retaliation against the country’s nine-percent white minority. A great number of Afrikaners seek refuge from increased delinquency by establishing closed communities, as testified by Kleinfontein, an all-white enclave just outside Pretoria, which exemplifies the deep racial divides that still preoccupy South Africa. There are three criteria for residing in Kleinfontein: residents must speak Afrikaans, be Protestant Christians and be descendants of the Voortrekkers (Dutch settlers). The several hundred people living in Kleinfontein say they “don’t feel safe” nor “welcome” in present-day South Africa due to the dramatically high crime rates. To blacks Kleinfontein is “a remnant of a painful past, a gated community of whites determined to perpetuate racist, apartheid-era practices”, but the Afrikaners who inhabit it see it as the only way to progress under what they consider a corrupt, black-led government. Many blacks echo the words of Winnie Madikizela-Mandela, Mother of the Nation and anti-apartheid enthusiast, who accused her former husband of giving in after 27 devastating years in prison: “Mandela went in prison as a burning young revolutionary. But look what came out […] He agreed to a bad deal for blacks. Economically, we are still on the outside. The economy is very much white.” For the masses, Mandela’s ex-wife speaks their language and is popular with those who feel that the government hasn’t done enough. Despite a rising Gross Domestic Product, income inequality and poverty pervade South Africa’s economic scenario. According to national statistics, blacks are 79.5% of the population and make up over 90% of the country’s poor. On the teeming streets of the black township of Soweto, on the outskirts of Johannesburg, street vendors and unemployed youngsters reluctantly admit that Mandela “did absolutely nothing for all the poor people of this country”. In the wake of economic distress and political corruption, a sizeable anti-regime movement, supported by many black students, blames Mandela for selling the fight for freedom to whites, and believes that the reconciliation process he set off acted as a boomerang. The same movement regards South Africa as an anti-black country ruled by the African National Congress to please the interests of the wealthy, white elite. Political scientists and academics ascribe the country’s persistent socio-economic disparity to Mandela’s negotiations with then-president Frederik Willem de Klerk and other apartheid-era politicians. Though the aim of these negotiations should have been South Africa’s transition to multi-racial democracy, they argue that, under the diplomatic façade, the white leaders’ position was: “we’ll give them the votes and the rights, but hold on to power dynamics”. The African National Congress is also to blame for its naïve belief that “by capturing political power they could automatically transform the economy” says William Gumede, professor at Johannesburg’s Business School. For this reason, South African political observers note that “there isn’t this kind of mania about Mandela here that there is overseas.” And according to Adam Habib, vice chancellor of the University of the Witwatersand, “the main criticism has been that he made too many concessions, while the real victims of apartheid still have to deal with the consequences,” not only an imbalanced division of income and power, but also, for example, urgent problems such as the HIV/AIDS crisis. As well as criticism on his inability to establish economic parity, condemnation on his political orientation – and relationship with leaders Gaddafi, Castro and Suharto — are widespread, both at home and elsewhere in the world. Mandela’s critics call him a terrorist because, in the first years of his struggle, he waged armed resistance to apartheid. They call him a communist because the Soviet Union was the African National Congress’s number one benefactor. David Horowitz, American conservative writer and creator of the think-thank Freedom Center, writes: “the country Mandela left behind is not an achievement worthy of praise” and Mandela is undeserving of the “unhinged adoration he is receiving across the political spectrum”. And yet, how do we explain the affection and admiration Mandela has drawn across such as vast and varied public? According to English actor Stephen Fry, the answer is that “Mandela is a good and great man. Such people are rare; and they have the unusual capacity to inspire public optimism and social solidarity.” Professor Tom Lodge adds: “it is the confessional quality of his autobiographical testimony that makes him such an attractively accessible public hero. Mandela’s private voice is compelling because of its vulnerability, and its self-insight.” Mandela’s willingness to conciliate Afrikaners, his genius in compromising, his delight in daily contact with his people erect him a “giant of history”. It was Mandela who insisted that post-apartheid South Africa adopt a hybrid national anthem incorporating verses in five official languages: Xhosa, Zulu, Sesotho, Afrikaans and English. When he was released from prison, despite the hardship he had had to bear, he promoted reconciliation and forgiveness rather than hatred and revenge: to imagine South Africa’s future without a leader like Mandela is alarming to say the least. His caliber and nobleness of spirit raised him above his jail-keepers, those in Robben Island and those in parliament, and paved the way for South Africa’s rebirth and its search for a new identity. After half a century of racial animosity, South Africa has most definitely been moving on. But in some areas of public, economic and political life, apartheid is an old habit, and old habits die hard. Although race still shapes South Africa’s landscape, Mandela’s success most certainly did not stall when his presidency ended in 1999 nor has it stalled now with his death. To blame or criticize Mandela as the creator of South Africa’s current economic and social inequality is inaccurate and simplicistic; never would he have wanted or predicted a country where blacks and whites still antagonize each other, and where his people’s aspirations suffer from unequal power and opportunities. That being said, South Africa is the capital of diversity, a reservoir of human resources, and has infinite potential to correct its disparities. Beinart, Peter. Don’t Sanitize Nelson Mandela: He’s Honored Now, But Was Hated Then.” The Daily Beast. Newsweek/Daily Beast, 5 Dec. 2013. Web. 16 Feb. 2014. <http://www.thedailybeast.com/articles/2013/12/05/don-t-sanitize-nelson-mandela-he-s-honored-now-but-was-hated-then.html#&gt;. Cropley, Ed. “Mandela’s legacy: peace, but poverty for many blacks.” Reuters. Thomson Reuters, 5 Dec. 2013. Web. 16 Feb. 2014. <http://www.reuters.com/article/2013/12/05/us-mandela-legacy-idUSBRE9B418320131205&gt;. “Leader, savior, terrorist: How white South Africans remember Nelson Mandela.” NBC News, 10 Dec. 2013. Web. 14 Feb. 2014. <http://www.nbcnews.com/news/world/leader-savior-terrorist-how-white-south-africans-remember-nelson-mandela-v21846245&gt;. Lodge, Tom. “Nelson Mandela: assessing the icon | openDemocracy.” Open Democracy, 18 July 2008. Web. 16 Feb. 2014. <http://www.opendemocracy.net/article/democracy_power/africa/nelson-mandela-at-90&gt;. Lyman, Rick. 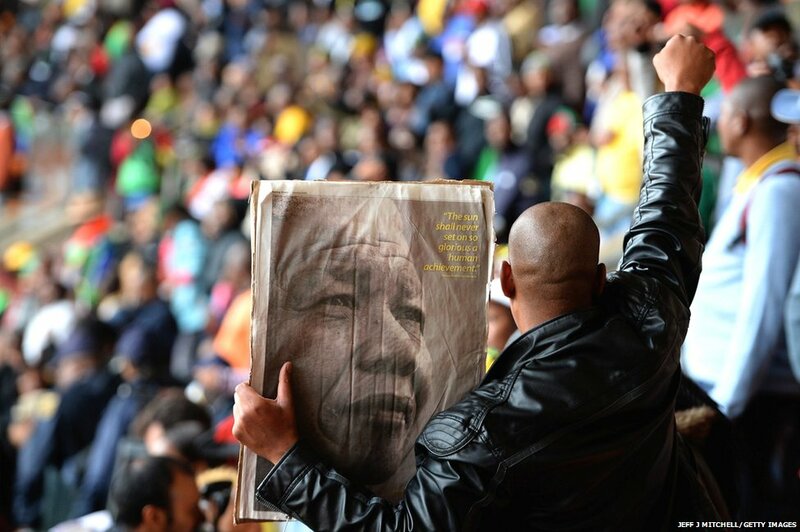 “For Mandela, Reverence, but Criticism, Too.” The New York Times, 6 Dec. 2013. Web. 16 Feb. 2014. <http://www.nytimes.com/2013/12/07/world/africa/mandela-politics.html?pagewanted=1&_r=1&gt;. Naipaul, Nadira. “How Nelson Mandela betrayed us, says ex-wife Winnie.” The Evening Standard, 8 Mar. 2010. Web. 16 Feb. 2014. <http://www.standard.co.uk/news/how-nelson-mandela-betrayed-us-says-exwife-winnie-6734116.html&gt;. Raghavan, Sudarsan. “Welcome to Kleinfontein, lingering outpost of apartheid South Africa.” Guardian Weekly. Guardian News and Media, 30 July 2013. Web. 16 Feb. 2014. <http://www.theguardian.com/world/2013/jul/30/south-africa-kleinfontein-apartheid-afrikaner&gt;. “Sudafrica dopo Mandela, i 4 interrogativi.” TM News, 6 Dec. 2013. Web. 16 Feb. 2014. <http://www.tmnews.it/web/sezioni/top10/sudafrica-dopo-mandela-i-4-interrogativi-20131206_141106.shtml&gt;.